"The BEST Online Insurance CE"
This blog highlights the various resources and bonus material in our online insurance CE courses. Every two-years, our insurance CE courses come up for renewal and we update the content with any important changes. The course I was updating recently, MA ELIGIBILITY & LTC PARTNERSHIP, is especially challenging because it reviews MEDICAID eligibility rules for Minnesota. These rules change over time as does the income and asset allowances. As I was looking up the current information, which can be difficult to find, and providing the reference links directly to our course material so agents taking our classes can find future updates, it dawned on me that this is yet another thing that sets Bryan Ventures' online insurance CE classes apart from our competition. You see, in addition to providing you with the information you need to know to help advise your clients, we offer you access to the web-pages of the source material so you can look-up and research the the material yourself. We offer you these connections to supplementary information so it helps make the topic come alive and offers you an enriched understand of our courses. This makes the online insurance CE more interactive and engaging in the process. Plus, you can bookmark them so that you can use them in the future. Since you are taking this class online, all this additional information is available with a click of your mouse on the internet. I frankly don't understand why other CE providers do not offer you this valuable connection to source information, but we're glad they don't. It's such a simple step that just makes our online insurance CE better. Related to engaging online insurance CE, it's important to note that later this year we'll be further enhancing the online courses with video segments recorded from our live classroom insurance CE courses. Look for updates in future emails, but in the interim, it's worth checking out our online insurance CE to find out why other agents say, "This is the BEST CE!" IMPORTANT NOTE: The aforementioned update of our MA ELIGIBILITY & LTC PARTNERSHIP course was while I was working in Mazatl�n at The Palms Resort. 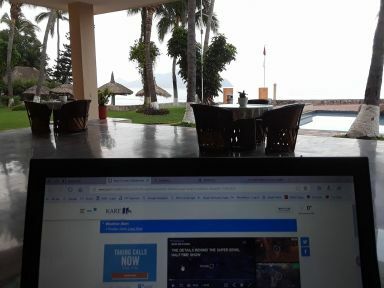 The picture to the right was taken while I slaved away writing this blog post. ;-) The Palms is where we are considering hosting live insurance CE classes the winter of 2019. If you have not yet, please take the SURVEY so you can offer your input about this potential class offering. This resort is just north of the Golden Zone--just a few minutes walk down the beach or street to many restaurants and shops. An Uber ride or taxi to the historic area is just a few dollars, and the patio, pool, and beach here are just wonderful. Top it off with they have a banquet area right here at The Palms where we could host classes. Please offer us YOUR OPINION. We want you to join us here so we can have a real fiesta (party in Spanish :D).